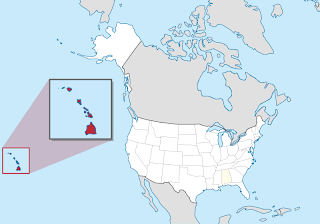 Hawai'i, one of only 2 states in the Union not connected to the rest of the mainland (the other being Alaska) and the only state not connected to the America's. It is an archipelago of islands located in the centre of the Pacific ocean. Given Hawai'is location, it has seen many influences from the lands around. Many Polynesian influences, as well as others from Asia, and the America's. Its temperate climate and rich soils (thanks to the volcanoes) have made it a breeding ground for many truly breathtaking and wonderful forms of plant and animal life. Hawai'i also is one of only 4 states that where independent nations before joining the Union. The others being the Republic of Texas, the Vermont Republic, and the California Republic. Also, Hawai'i, along with the Republic of Texas where the only states to hold international recognition. It has also been an independent kingdom as well as an independent republic after the King was overthrown by American and European businessmen. The islands of Hawai'i where originally settled by Polynesians who brought with them pigs, dogs, coconut, banana, sweet potatoes, sugar cane, chickens and taro. The first Europeans where most likely the Spanish in the mid-1500's, though there are no solid records. The first contact with the natives, and extensive documentation was by Captain James Cook. He arrived in January 1778, and named the islands the "Sandwich Islands," after his sponsor, the Earl of Sandwich. Until Kamehameha I, the islands themselves where ruled by various independent rulers on each island. In 1810 Kamehameha united the islands as 1 kingdom under him. 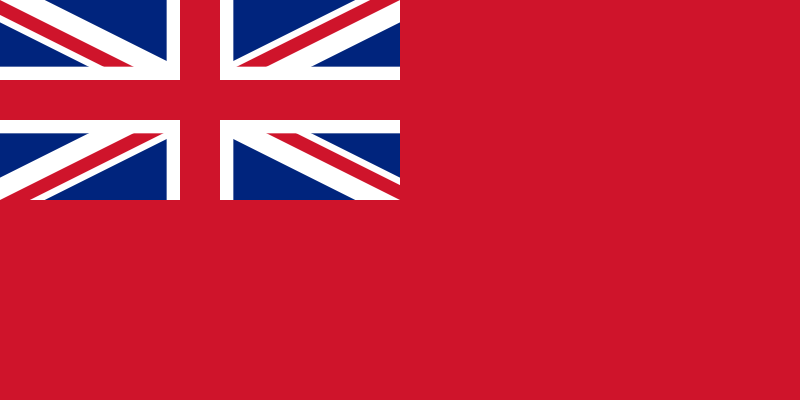 Originally, as a sign of friendship with the United Kingdom, Kamehameha I raised a British red ensign to fly over his Kingdom. However, he lowered it to placate American interests and rose the American flag. However, under strong protests from British naval officers, Kamehameha I opted to commission a new flag. 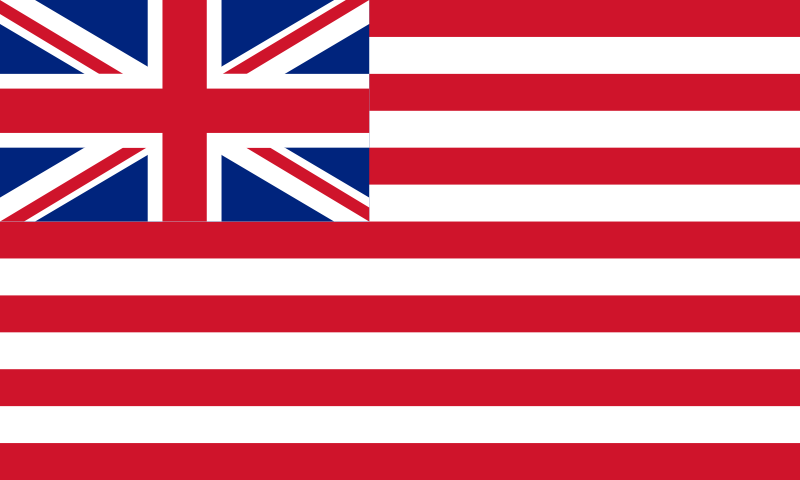 It was a deliberate hybrid of the two flags, and was probably inspired by the flag used by the British East India Company. 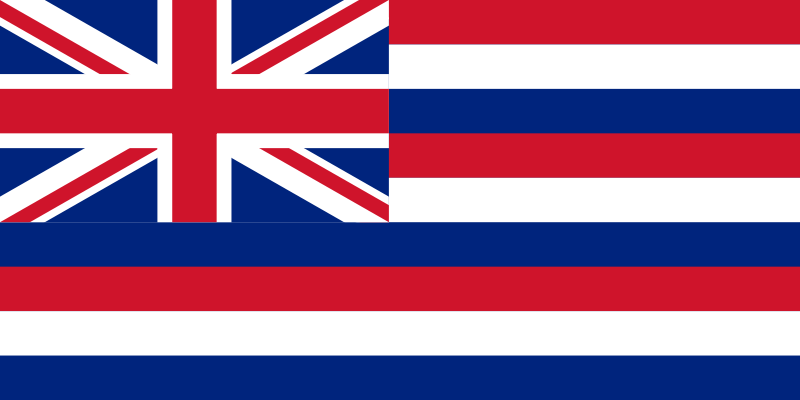 The first flag of Hawai'i consisted of the Union Jack in the upper canton, and had 9 stripes alternating red, white, and blue. There has been a lot of debate over whether the flag should have had 7, or 9, and in what order! The Kingdom of Hawai'i did not manage to escape the attentions of the major powers, with America, France, Britain and Russia all vying for control. Indeed, Lord George Paulet in 1843, on board HMS Carysfort forced King Kamehameha III to cede control to Britain. Under the guns of his warship, he was forced to do so. However, letters went forth to protest this action, and later that year Rear Admiral Richard Darton Thomas, Paulets senior officer, arrived to repudiate Paulets actions and restore Hawai'i's government. However, by 1887, life was not all well in Hawai'i, and there was a push by the Reform Party and an armed militia forced the King to sign a new constitution that stripped the monarchy of many of its powers. However, when the king died, his sister Lili'uokalani drafted a new constitution, giving back the monarchy its powers, and restoring universal suffrage. However, in 1893, the Committee of Safety was established by American and British residents who, fearful of the new Queens actions, moved to overthrow the Queen and set up a new Republic with a view to being annexed by the US. However, the annexation was not forthcoming. The Queen protested to the US, and initially the US found that its officers had played a material role in her overthrow, and moved to have her reinstated. However, the new President refused to reinstate her, and the US eventually found that the US itself had not played any major part, and was thus free to negotiate with the new Republic. However, in 1895, there was an attempt to reinstate the Queen. But the rebellion was crushed. Finally, in 1897, President McKinley agreed a treaty of annexation, only to see it fail in the Senate, where the opinion was that the US' actions over rode those of the people living within Hawai'i, and was against their wishes. However, in 1898, McKinley did sign a treaty, the Newlands Resolution which effectively illegally annexed Hawai'i, creating the new Territory of Hawai'i. Hawai'i remained as a territory until the Democratic Revolution of 1954, which saw mass strikes, acts of civil disobedience, and protests. The Hawai'i Republican party finally lost the governorship of the territory, and the Democrats gained power and held it for nearly 60 years, until 2002. Once in power, the Democrats pushed for full statehood, and President Dwight D. Eisenhower signed the Hawai'i Admission Act in 1959, making Hawai'i the 50th state. Once statehood was granted, native Hawaiians pushed on for greater freedom, for more home-rule. This has also seen a rise in the use of an alternative Hawaiian flag. This consists of 9 horizontal stripes of red, yellow, and green. In the centre of the flag is a green shield featuring the kahili, the original Royal Standard. Crossing the kahili are 2 Hawaiian paddles. Each stripe represents one of the nine Hawaiian islands. This flag was supposedly recreated from King Kamehameha's original standard, but there is no proof that it was used by him. Nor is it widely used by the sovereignty movement, since the current flag was in use by Hawai'i long before Hawai'i became a US state. 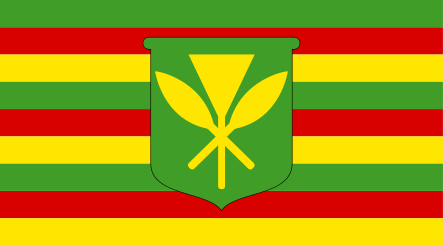 The current flag in use in Hawai'i saw the number of stripes cut from 9, to 8. The stripes run white, red, then blue, white and red twice. It was introduced following the overthrow of the Queen, and has remained in use since. The seal of Hawai'i goes back to the arms of King Kamehameha I, who unified the islands. His Coat of Arms consisted of a quartered shield. In the upper left, and lower right, it bore the stripes from the flag, and the other quarters where golden, and bearing a tabu ball on a black staff. In the centre is a green shield with the Royal Standard, and 2 crossed paddles. The supporters are traditional Hawaiian warriors, one with a spear, and the other with the Royal standard. Above the shield is the Royal crown. However, with the abolition of the monarchy, the new republic commissioned a new seal from the Royal College of London. It carried on many of the elements from the Royal Coat of Arms. The shields shaped was altered, with the addition of extra filigree. The crown was also removed, and replaced with a rising sun. Beneath the shield is a Phoenix, to symbolize the rebirth of Hawai'i. It also bore the state motto of Ua Mau ke Ea o ka Aina i ka Pono. Over the top, it carried the title of "Republic of Hawai'i, as well as the year 1894, the foundation of the new Republic. Also, the republic replaced the two warriors with King Kamehameha I, and the Goddess of Liberty. Over the years the seal was altered, but only slightly. 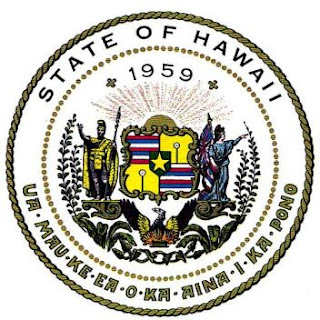 With the annexation by the US, the title "Republic" was replaced with "Territory" and the year was altered to 1900.
finally, with Hawai'is admission as a full state, the seal was modified for the last time. This time with "Territory" being replaced with "State" and the year being altered to 1959. Also, the Royal arms where replaced with a single gold star. The star represents Hawai'i as the 50th state. I suggest doing more research and actually fact checking before providing false information. - Hawaiʻi is not now or has ever been part of the United States, but under an illegal and prolonged occupation! - Hawaiʻi never "joined the Union" because a joint resolution is merely a law, an act of Congress. It has no power to acquire the territory of a foreign, sovereign state. And as for the vote for statehood, more importantly who orchestrated the vote called the U.S. congress. The U.S. congress is limited to U.S. territory, meaning it does not matter who voted. And anything that was voted upon is still limited to U.S. territory. - Hawaiʻi is an independent kingdom under an illegal occupation. And the "Republic of Hawaii" also known as The Provisional gov’t (usurpers) were neither de facto nor de jure. Meaning they were only self proclaimed and not (defacto) the result of a successful revolution or (dejure) the result of a lawful election. The legal definition for the State of Hawaii who is in actual control of Hawaii is an Armed Force. Lawfully it cannot be a government not even a de facto one. It was created by a lawful U.S. gov’t but is limited the U.S. territory. Once it goes outside of U.S. territory and into another states territory it is now defined as an Armed Force or it’s creator hence the occupation. - There was no King during the overthrow, however there was a Queen named Liliʻuokalani. "However, he lowered it to placate American interests and rose the American flag. However, under strong protests from British naval officers, Kamehameha I opted to commission a new flag. 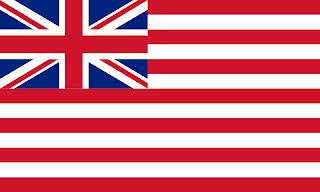 It was a deliberate hybrid of the two flags, and was probably inspired by the flag used by the British East India Company." - You did not cite your source for any information. - Hawaiian Kingdomʻs Flag: During Kamehameha I, every island aligned themselves with other countries. The religion at the time was also an influence on how the way the flag was made. King Kamehamehaʻs Akua was Kūkailiʻmoku, and his color was red. That is why there are red stripes on the flag. He was the God of government, politics, and if neither worked there would be war. Then there is Lono, his color is white. He was the God of agriculture, fertility, sports, and peace. The two blue stripes are the other Akua. 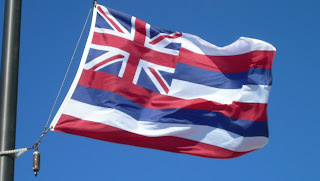 The long blue stripe on the flag represents Kanaloa and the short blue stripe represents Kāne. Kanaloa was the God of the ocean, and the reason why his stipe is longer is because it signifies the wide expanse of the ocean that we are from. Kāne is the God of fresh water. If you notice, the stripe at the top of the flag is white and the bottom stripe is red. Right side up means Peace, while upside down means war. Interesting as it is, it plays in very well with the international flag meaning. Internationally speaking, when a flag is upside down, that means a country is in distress. - When Queen Liliʻuokalani took oath, it did not state that she maintain the 1887 Bayonet Constitution, but rather “the Constitution.” The Bayonet Constitution was never ratified by the Legislative Assembly, so therefore it was never a constitution to begin with. The 1864 Constitution remained the constitution of the country. - The so-called Committee of Safety sought support from U.S. Minister John L. Stevens on January 16, 1893 to order the landing of U.S. troops to protect the insurgents while they prepared for the annexation of the Hawaiian Islands to the United States by a voluntary treaty of cession. U.S. Minister John L. Stevens thus violated international law and the sovereignty of Hawaiʻi by landing U.S. troops on Hawaiian soil. - The U.S. cannot exonerate itself in an international violation. The Morgan Report is legally meaningless in that regard. It may be interesting historically, but it is useless in refuting that the invasion was illegal. The fact that only pro-annexationist supporters of the traitors testified (aside from Blount himself) reveals the bias, but the report is legally meaningless anyway. It is like a person holding a trial in which he is defendant, prosecutor and judge, and where only his friends testify, then proclaiming his innocence. After he had already confessed to the crime. Next, the United States engaging in diplomacy with the government its military had a direct hand in helping to establish—which the executive branch (responsible for foreign relations) found would not have existed without U.S. intervention—is entirely meaningless in establishing the legitimacy of that government, or its authority to cede the territory or sovereignty of the state, even if there had been a treaty of cession (which there wasn't). - A nation-state taken over by another nation-state is either occupied or annexed, but cannot be both simultaneously. In summary, without a treaty of cession, Hawaiʻi is not annexed to the United States. Without annexation, Hawaiʻi was never admitted to the United States. 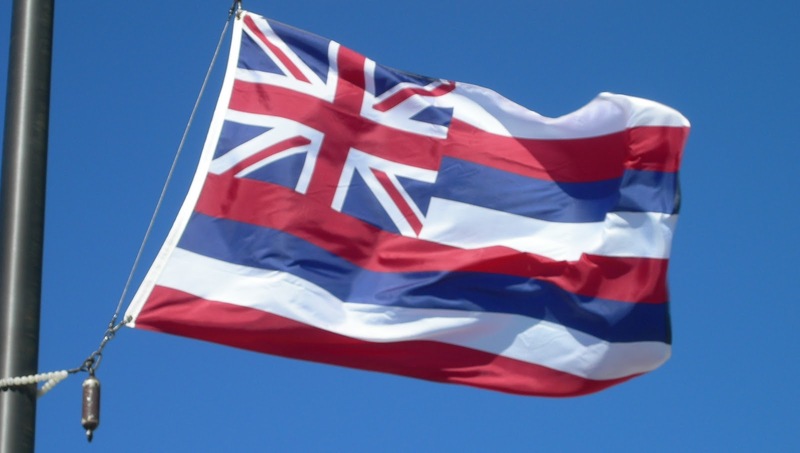 Without admission, Hawaiʻi cannot be called a state of the United States. What you have instead in Hawaiʻi is an occupant government masquerading as a state. - The "alternative Hawaiian flag" is a fraud because there is no evidence to support that this flag ever existed. "At the opening of the Legislative Council, May 25, 1845, the new national banner was unfurled, differing little however from the former. "It is octo. (eight) parted per fess (horizontal band), first, fourth and seventh, argent (silver represented by the color white): second, fifth and eighth, gules (the color red): third and sixth, azure (light purplish blue), for the eight islands under one sovereign, indicated by crosses saltire, of St. Andrew and St. Patrick quarterly, per saltire counter changed, argent (white) and gules (red)." The Hawaiian flag previous to 1845 differed only in the amount of stripes, which was formerly "seven", and also the arranging of the colors. Previous to 1845 the white stripe was at the bottom instead of the present position of at the top. 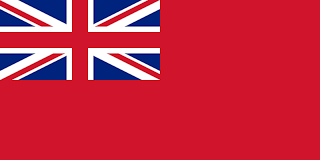 The person accredited with the designing of the new flag, which was unfurled before the 1845 Legislative Assembly, was Captain Hunt of H.B.M.S. (Her British Majesty's Ship) Baselisk. The Union Jack represented the friendly relationship between England and Hawai'i, and also noting that it was England and France that formally recognized the Hawaiian Kingdom as an Independent State and admitted her into the Family of Nations on November 28, 1843.